The resulting “Inspection Returns of Ordnance at the U.S. Navy Yards” is both a monument to bureaucratic paperwork and a boon for modern-day researchers. In 15 dense columns, the report provides the dimensions, weight, and condition of each piece, as well as remarks on their form and condition. By the time Jones performed the survey at the Charlestown Navy Yard in 1833, Constitution had been laid up “in ordinary” for five years, and had just entered the new drydock for repairs. As was the usual practice, all of the ship’s stores, rigging, and guns were landed and placed in storage. Navy Yard laborers laid the guns on granite skids to elevate them off the ground, and coated them with a protective layer of black lead, “lacker,” or cold tar. Jones’ inspection return broke down the guns he surveyed at Charlestown by type, and most important, grouped them by the ship to which they belonged. He clearly denoted the guns that belonged to the sloop Boston, the ship-of-the-line Independence, and Constitution. 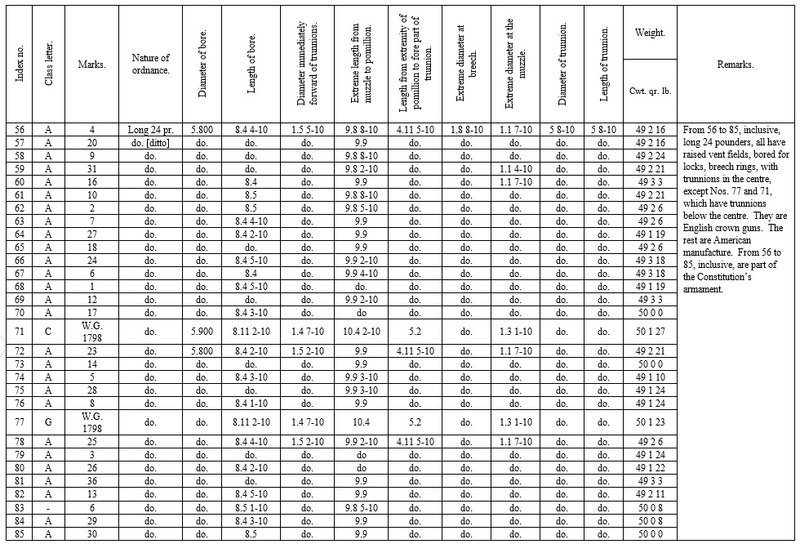 Below are transcriptions of his tables containing the weights and measures of the long guns and carronades in Constitution’s battery. Most of the measures are self-explanatory. The column titled “index number” provides a unique identification for each gun of a particular type at the Navy Yard. The second column, labeled “class letter”, denotes “that every gun of that particular denomination, marked with the same letter, will fit the same carriage, and is used on the same deck.” The gun weights are given in the old hundredweight system, broken into hundredweights (112 lbs) quarters (28 lbs), and pounds. These tables provide a snapshot of the ship’s guns that had been on board since she was readied for Mediterranean service in 1821. Reference to Navy Department correspondence tells us in 1816 the ship’s 24-pounder long guns- the ones that had seen her through the War of 1812- were taken to arm the newly-outfitted ship Independence. These same guns were then returned to Constitution in 1820 and presumably stayed on board until she was taken into the Navy Yard in July 1828. This detail of Charles Waldo’s drawing shows the “new” 24-pounder, the “old” 24-pounder, and the 32-pounder carronade. In about 1820, Charlestown Navy Yard Sailing Master Charles Waldo, himself a veteran of Constitution’s crew, drew the three types of guns still earmarked for the ship’s batteries. He drew two long guns and a carronade. The long 24-pounders are labeled “old” and “new”- the implication being that the old guns were the ones that had been on board during the late war, and that the new ones were either new to the ship or of a new pattern. The form of the “old” gun generally matches the description of the guns given by Jones in 1833, although the measurements vary slightly. A note accompanying the drawing says the “new” guns had recently been sent from Washington to replace the guns sent on board the Independence. The carronades, those short-barreled, close range guns designed to throw a heavy shot capable of shattering an enemy ship’s timbers, may also have served for a long time with the ship. Supplied by contract from the Columbia Iron Works in 1809, the guns made it into Jones’ 1833 survey, and were possibly still with the ship in the 1840s. In an 1816 letter, Commodore William Bainbridge noted, “…In the action with the Java, two of the Carronades on board the Constitution were in the early part of the action struck with violence by the enemy’s round shot, so much so as to make considerable indentation in the guns, yet these carronades continued the remainder of the action in a active & servicable [sic] fire, and are to this day safe pieces of ordnance.” In 1844, Lieutenant John B. Dale wrote, “One of the guns on the quarterdeck has a groove in its side reamed out by a British ball during the last war, which killed, it is said, a man at the wheel.” These two comments seem to refer to one of the same guns (but what happened to Bainbridge’s second scarred gun in the intervening decades is anyone’s guess). These carronades were made with a mounting lug beneath the barrel (what Jones calls the “nave”) and featured holes in the cascabel to accept an elevating screw. Waldo’s drawing shows the guns, although he has not included the breech rings or indicated a raised vent field, both features mentioned by Jones. Jones’ inspection return provides one further surprise. Two of Constitution’s long guns and two of her carronades were made in Britain. The 24-pounder was a “Blomefield pattern” gun adopted by the Royal Navy beginning in 1787. The carronades were probably of the classic Carron Iron Works pattern used by the Royal Navy through much of the Napoleonic Wars. It is hoped that some of this information will help us identify some existing guns that might conform to types carried on Constitution during the War of 1812 and the following decades. If you know of any early 32-pounder carronades or 24-pounder long guns that match these measurements, we’d love to hear from you! Jones’ inspection returns were published as part of a larger inquiry into the establishment of a national foundry in 1835 [Rep. No. 141]. The original is in the ZC (Ship) Files in the Navy Department Library. Thanks are due to Margherita Desy for providing a digital copy of Waldo’s drawing. The “new” guns may be of the pattern authorized in 1816 as part of the “gradual increase” of the Navy authorized by Congress in that year. A similar gun, with the same W.G. 1798 marking, is on display at the New York Maritime College at Fort Schuyler. School tradition claims this gun came from Constitution.